SYRACUSE, NY, February 6, 2018 – The Institute for Veterans and Military Families (IVMF) at Syracuse University has received a $50,000 grant from Travelers. The IVMF provides career skills training and entrepreneurship programs that meet transitioning service members, veterans, and military spouses where they are in their civilian transition to position them for future success. Two programs in IVMF’S entrepreneurship portfolio, Veteran EDGE and V-WISE, will use $25,000 each to support their conferences. 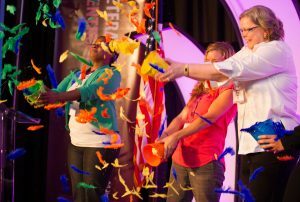 Veteran EDGE is the first-of-its-kind 3-day conference dedicated solely to veteran and military spouse business owners and the ecosystem that supports them. Stakeholders, IVMF program graduates, and veteran and military spouse-owned businesses from around the country gather to network, and learn about the latest opportunities, best practices, and resources available to their growing companies. V-WISE is a women-focused training program in entrepreneurship and small business management that provides tools, ongoing support and business mentorship to veterans, active-duty service members and military spouses aspiring to become successful entrepreneurs. This year, the IVMF will be hosting its 20th V-WISE conference in San Diego. Over 2,667 women have graduated from this program since its inception, with 65% starting their own business and 92% who are still in business today. In addition to supporting the conferences, the grant from Travelers will cover a V-WISE training program. Travelers will also offer a business continuity workshop geared toward veteran-owned businesses at each conference. The grant is a direct investment in our nation’s veterans, service members, and their family members. Travelers is ensuring opportunity by contributing to efforts that create strong, vibrant communities and offer pathways to success. Through corporate funding and the Travelers Foundation, Travelers targets its giving to three key outcomes: academic & career success, thriving neighborhoods and culturally enriched communities. With the primary focus of educating underrepresented students to lead tomorrow’s workforce, Travelers also contributes to organizations that aid in developing communities through small business support and neighborhood revitalization, and enriching lives and learning through arts & culture.